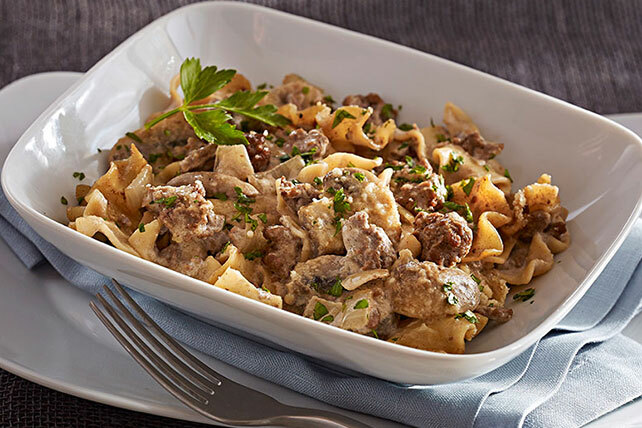 Find an easy beef stroganoff that even the strapped-for-time crowd can pull off. Our Easy Beef Stroganoff Casserole version is ready in under an hour. Cook noodles as directed on package, omitting salt. Meanwhile, melt butter in large deep skillet on medium heat. Add onions; cook and stir 5 min. Add mushrooms; cook and stir 5 min. Add meat to skillet; cook, stirring to break up meat, until no longer pink, about 5 min. Add Worcestershire sauce and pepper; cook 1 min. Add flour to meat mixture; cook and stir 1 min. Add broth; cook and stir 5 min. Turn off heat; stir in sour cream. Add noodles and 2 Tbsp. Parmesan to meat mixture; mix well and spoon into 2-qt. round baking dish. Sprinkle with remaining Parmesan. Bake, uncovered, 20 to 25 min. or until heated through. Sprinkle with parsley. Serve with a mixed green salad and your favorite fresh fruit to round out the meal. Prepare using 2 cups sliced cremini or baby bella mushrooms. Prepare casserole in foil-lined baking dish, making sure there is enough foil extending over edges of dish to cover and seal. Freeze casserole until firm. Remove from dish; wrap tightly with foil. Place foil-wrapped casserole in freezer-weight resealable plastic bag. Label and date. When ready to thaw, unwrap frozen casserole and return to original baking dish. Thaw overnight in refrigerator, then bake as directed just before serving.